I am so happy to be here and want to talk about something close to my heart today. With a sister who died from melanoma I want to make it my mission to educate people about sun protection. products out there that you maybe wouldn't necessarily think of that you can use to keep your family safe. We only one one skin. When our skin gets old and wrinkley too early, we can't just go buy "new skin". What we need to do is protect the skin we already have. And as parents, we need to start when our kiddos are babies. Yes, babies. The earlier the better. The sun can be very damaging to your families skin and you need the right tools to protect your families skin from those harmful rays. 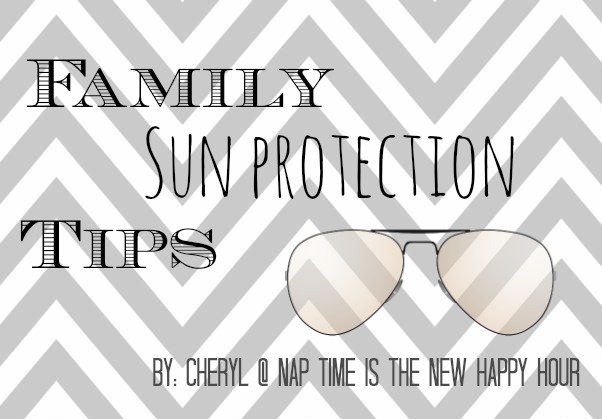 With spring here and summer right around the corner I wanted to do a post to help you and your family keep those harmful rays off of you and your loved ones. The higher the SPF the better. I personally buy Neutrogena and Aveeno for my family. They are not harsh to the skin and work amazingly well. These are my favorite beach attire. Not only does it work as a shirt but it also keeps the sun off their chest. It is a shirt that has SPF. Even though it was as a sun protection you still should put sunscreen on them. Just in case. I get my son's sun shirts from Target and Old Navy. Old Navy has a great selection of cute and trendy ones. Enough said. Sunglasses help protect their eyes from the sun. And not only do they protect from the sun but those baby aviators get them every time. So cute! The key to these are the back and side flaps. The extra flaps help keep the sun of their ears and back of the neck. My favorite brand for these are from iPlay. This is by far the best beach invention. They are normally easy to put together and big enough for your whole family. You can spend all day at the beach or under the sun if you have one of these. It is a great place to get out of the sun and rest. If you dont have one of these I would highly recommend getting one. Espeically in this Florida heat. Again, great accessory but also great for keeping the sun off of the face. Which in turn helps keep wrinkles away. Totally invest in one of these if you don't already have one. I got a cute one from Ann Taylor Loft. Not only do coverups keep the sun off of you they also hide some of those areas of our bodies that we want to keep...hidden. I can't tell you how many cover ups I own. Its a ton! I buy a lot of mine from TJ Maxx. Like the kids, these will help protect the eyes from those harsh rays. My husband's go to sunglasses are his Costa Del Mar's. Guy's dont have too many options besides sunscreen, bathing suit and a shirt but a hat like a baseball hat will help keep the rays off his face. So who said that sun protection can't be fun and fashionable?! Not this girl. The most fashionable thing about sun protection is that you will be cancer free. I don't know whats better than that! 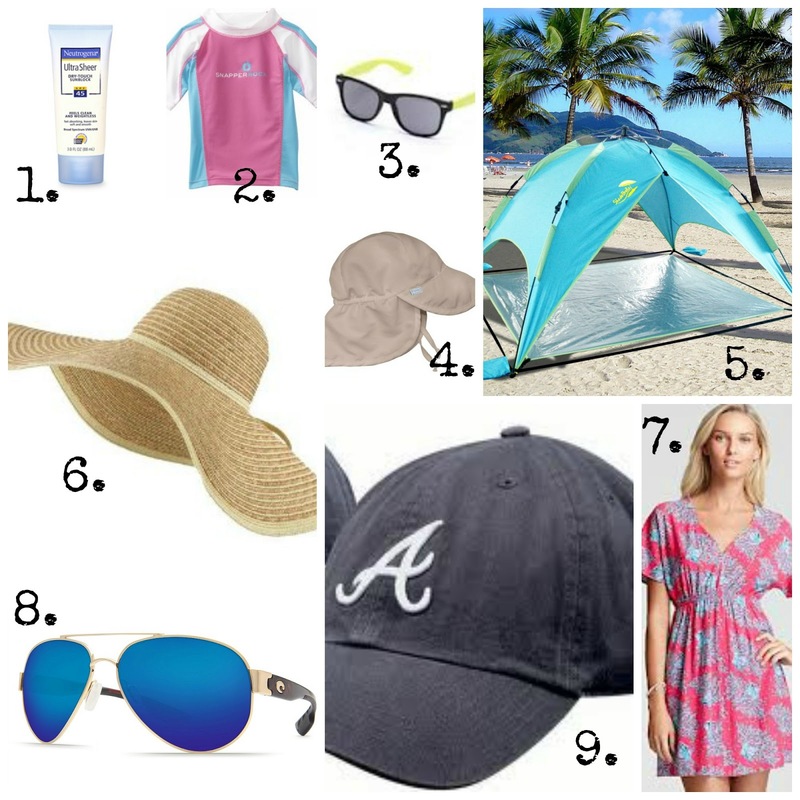 Now go scoop up the kids and slather some sunscreen and follow these simple tips and hit the pool or beach!